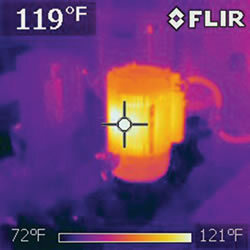 The FLIR i7 thermal camera is light-weight, compact, and rugged, for use in harsh environments. Easy-to-use: The FLIR i7 is fully automatic and focus-free with an intuitive interface for simple measurement. Compact and rugged: The camera's low weight of 0.365 kg and an accessory belt pouch make it easy to bring along at all times. 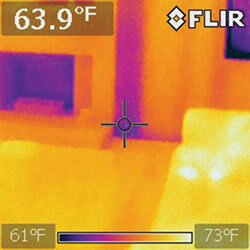 Ground breaking affordability: The i7 thermal camera is the most affordable infrared camera on the market. Find problems faster and more accurately with the rugged, high-resolution FLIR i7 point-and-shoot thermal imaging camera. Durable and easy to use, FLIR i-Series infrared cameras offer better images, an optimized display for faster inspections, and a combination of thermal sensitivity and measurement accuracy typically only seen in cameras costing thousands of dollars more. It's ideal for energy auditors, building inspectors, electrical contractors, predictive maintenance specialists, HVAC professionals, insulation experts, restoration contractors, and many more. The FLIR i7 thermal imaging camera with a 19,600-pixel resolution (view larger). The FLIR i7 camera has a 140 x 140 resolution for 19,600 total pixels and a thermal sensitivity of <0.10 degrees C. All i-Series cameras capture thousands of calibrated temperature measurements in every image to produce a complete thermal picture that shows where hot spots and other heat-related problems are immediately, so you can find them faster, diagnose them more accurately, and work more efficiently than ever. Built with ruggedness you can trust, all i-Series cameras are also tough enough to withstand a two-meter drop and stow right alongside other tools, and meet IP43 dust/splashproof standards. It's extremely lightweight at just 13 ounces, helping to reduce fatigue. It has a focus-free lens, 2.8-inch color LCD, rechargeable battery that lasts up to 4 hours, and microSD memory card storage (with an included 2 GB card that can store up to 5,000 radiometric JPEG images). This camera is backed by FLIR's industry-leading 2/5/10 warranty, providing 2 years of coverage on all camera components, 5 years of battery coverage, and a 10-year warranty protection for the infrared detector. FLIR's point-and-shoot i-Series cameras are the most cost-effective choice for getting a new infrared program off to a strong start or arming everyone on your team with the power of thermal imaging. They provide high-quality thermal images and temperature data to help find wasteful energy loss, locate moisture damage, document repairs, detect energized equipment, minimize downtime, and more. Much easier, faster, and safer to use than IR thermometers, and far more accurate, FLIR i-Series cameras are the ideal temp gun replacement for your tool box. While spot IR thermometers present only a single temperature at a single spot, these Thermal Imaging Cameras give you the whole picture--equal up to ___ spots. Thermal imaging is the most effective method for finding problems or potential problems in a variety of applications across many fields. 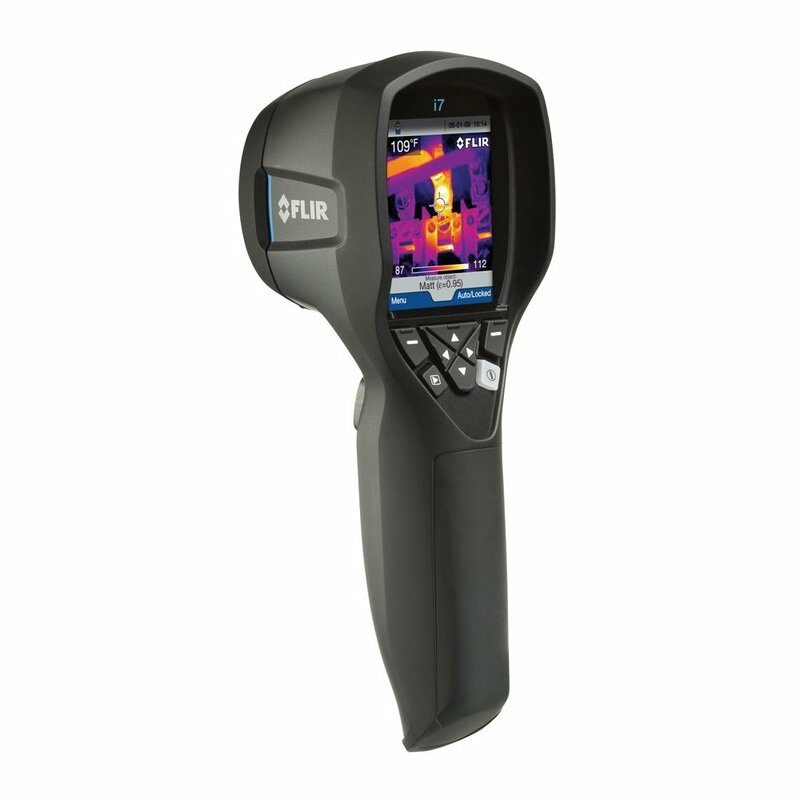 If you are new to Thermography and need a general purpose Thermal Imaging Camera for troubleshooting, the FLIR i-Series is a great choice. The FLIR i-Series is fully loaded with Thermal Imaging functions at a fraction of the price of a professional grade camera.